MicroGoose is environmental monitor (by Geist / IT WatchDogs) capable of measuring temperature and humidity. 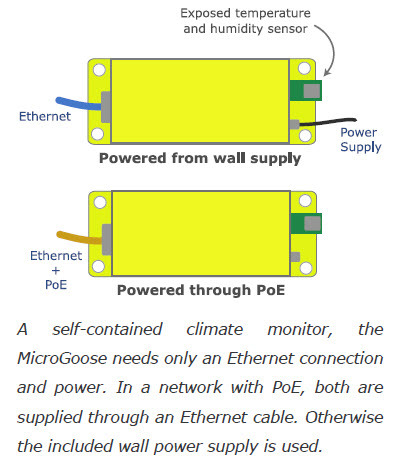 This Environmental Monitor featuring PoE (Power over Ethernet) is ideal if you are having trouble accessing power but need to monitor temperature and humidity. 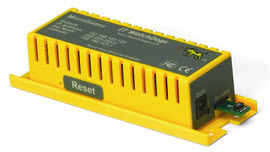 This small module can be placed discreetly and be up and running within minutes with only a single Ethernet connection for access. When integrated with the iMCA System, you can not only remotely monitor temperature and humidity but also create virtual connections with any switches registered in the iMCA System such as static, pulse, IR, security arm or disarm etc. You can easily create and execute any number of automation scenarios based on sensor information from this unit, without having to deal with any cryptic codes or learning a scripting language. Using this device and the iMCA System you can affordably build effective Climate Control solutions and receive alert notifications via email and SMS when desired environmental thresholds are exceeded. Built-in temperature and humidity sensors.